The assassination of Austrian Archduke Franz Ferdinand is perhaps the most important single event of the 20th Century – the spark that ignited the hellish inferno of the First World War, which in turn lead to the Russian Revolution, the Treaty of Versailles and the Weimar Republic, the rise of the Third Reich, the Second World War, and the Cold War that followed. Who was responsible for the murder of the heir to Austro-Hungarian Empire? Who lay behind this event that shaped our modern world? Well, there were the young radicals who carried out the terrible act ... but there were also powerful figures in Vienna who stood to benefit from the death of Franz Ferdinand. Franz Ferdinand hadn't expected to inherit the throne until his cousin Crown Prince Rudolf committed suicide. It soon became clear that Franz Ferdinand would not play the role of obedient heir. Instead he brought scandal to the royal family and made powerful enemies in Vienna. As disliked as he was in the royal court he was loathed even more by Serb nationalists who saw him as an embodiment of Austrian imperialism in the Balkans. Franz Ferdinand with his wife Sophie and their children. Franz Ferdinand fell in love with a noble woman called Sophie Chotek. But his uncle Emperor Franz Josef did not approve of the marriage - he believed that his heir should marry a princess. Franz Ferdinand insisted and the emperor angrily relented. Franz Ferdinand and Sophie were constantly humiliated by the stuffy Viennese court. Their marriage was "morganatic" - Sophie could have no official role and their children could not inherit the throne or other royal titles. Map of the Austro-Hungarian Empire at the time of the First World War. The area in mauve shows the Austrian part of the empire and the area in buff shows the Hungarian. Both parts were centrally administered from Vienna. Bosnia, which had been part of the Ottoman Empire, was annexed by Austria in 1908. This caused tensions with Serbia and its ally Russia. The Austro-Hungarian Empire encompassed much of modern Central and Eastern Europe and the Balkans. Austria was allied with the German Empire of Kaiser Wilhelm II, but had entered into an increasingly bitter rivalry with tsarist Russia. The Russians supported the Kingdom of Serbia, and the Serbs wanted Bosnia and other areas to join them in a new pan-Slavic nation. Powerful people in Vienna wanted to go to war with Serbia, even though this could lead to war with Russia. But Franz Ferdinand was more cautious. He was no pacifist; however, he feared that his uncle's multi-ethnic empire would disintegrate in the event of a major war. Archduke Franz Ferdinand and Sophie about to get into their automobile for the motorcade through Sarajevo, on 28 June 1914. After a failed attempt to blow up their car with a bomb, the couple were then fatally shot. Gavrilo Princip (main photo), the man who killed Franz Ferdinand. The conspirators (seated left to right): Trifko Grabez, Nedeljko Cabrinovic, Gavrilo Princip, Danilo Ilic, and Misko Jovanovic. Others involved in the plot either escaped or were never formally identified. The Serbian nationalist group the Black Hand was blamed for the attack. 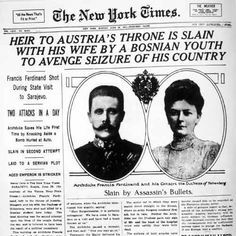 In world historic events such as the murder of the Austrian archduke and his wife, it's easy to forget about the individual victims. 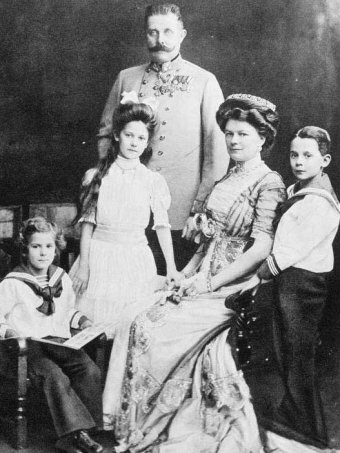 Franz Ferdinand and Sophie were doting parents to three young children (left to right): Ernst, Sophie, and Max. The boys had especially tragic fates. As potential claimants to the Austrian throne, Hitler had them thrown into a concentration camp following the Anschluss, where they would endure years of hard labor.